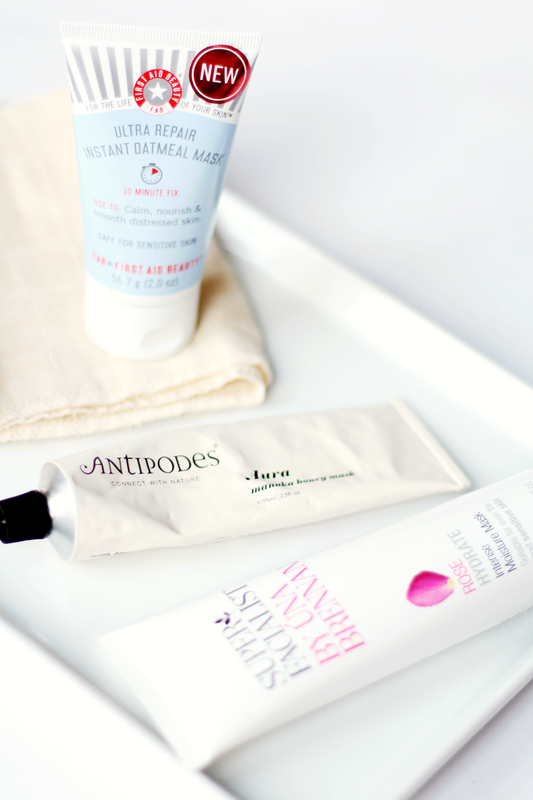 The Antipodes Aura Manuka Honey Mask was the first hydrating one I picked up after seeing it on a few other blogs. It’s a clear, smooth mask which has a lovely scent and, after leaving it on for 10mins, it leaves your skin looking fresher and healthier. The honey in it is also really good for blemishes as it’s antibacterial, so if you’re spot prone, this may help you in more ways than one! Up next is the First Aid Beauty Ultra Repair Oatmeal Mask which is much chunkier than the one previously mentioned, as it has actual pieces of oatmeal in it. The scent is as you’d expect, but what I love about this mask is how soft and smooth your skin feels after you remove it! It’s fantastic to use after a clay mask to restore the moisture too. Finally, if you’re on a tighter budget, pick up the Una Brennan Superfacialist Rose Intense Moisture Mask. For starters, the tube is huge so it’ll last you ages and the rose scent is really quite lovely! I don’t find this to be as hydrating as the other two, but it still leaves your skin feeling bouncy and restored! It’s a good one to try if you’re not sure how they work!